M-8 Amplifier Amplifiers | Fretted Americana Inc. This wonderful 1958 Rickenbacker M-8 combo weighs just 10 lbs and is a sweet little practice amp with a dark warm tube tone. It has been recently serviced, the original Jensen CQ8 eight inch speaker has been expertly re-coned and all the wiring is to original specifications. The M-8 is 13 3/4" wide, 11 3/4" tall and 5 1/2" rising to 6" deep at the sloped bottom. 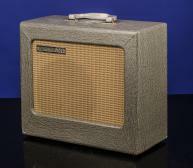 Original silver-gray tolex covered cabinet with four original metal feet. 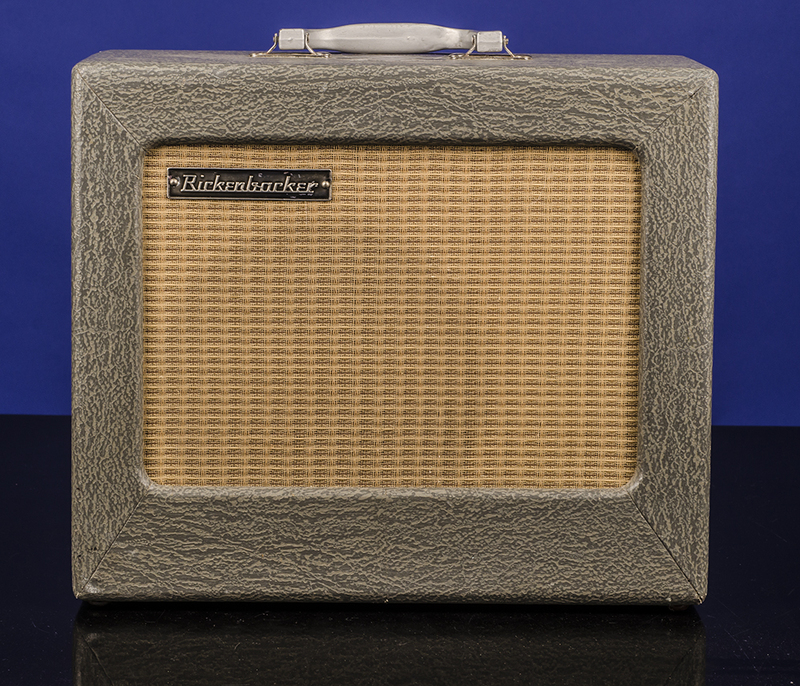 Original tan grill cloth with a rectangular metal "Rickenbacker" logo plate and original gray plastic handle. 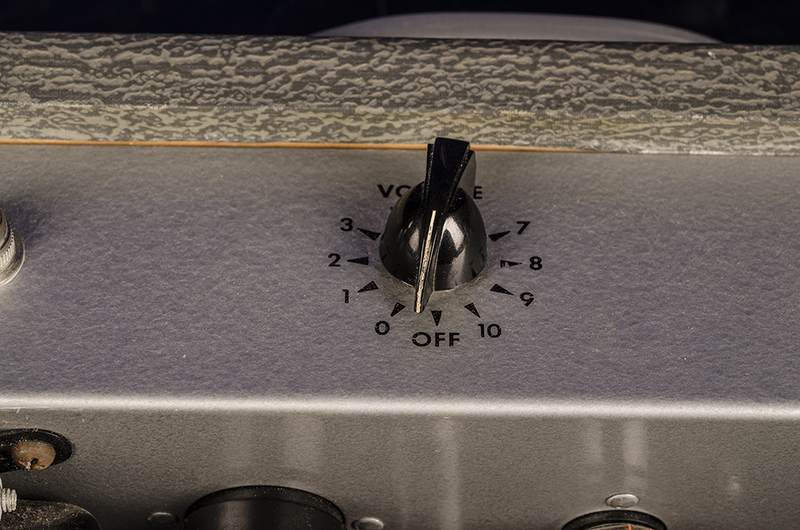 Gray metal control panel with a single chicken head volume and on/off control knob, dual inputs and a 1 amp fuse. 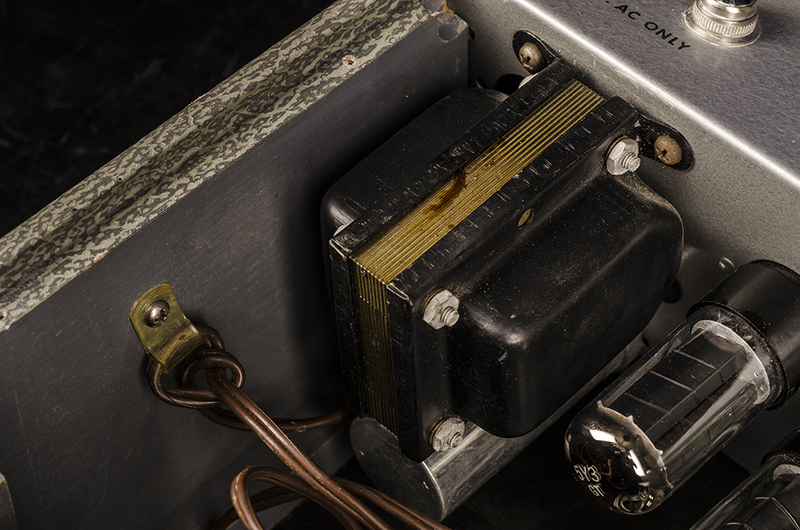 The potentiometer is dated November 1958. 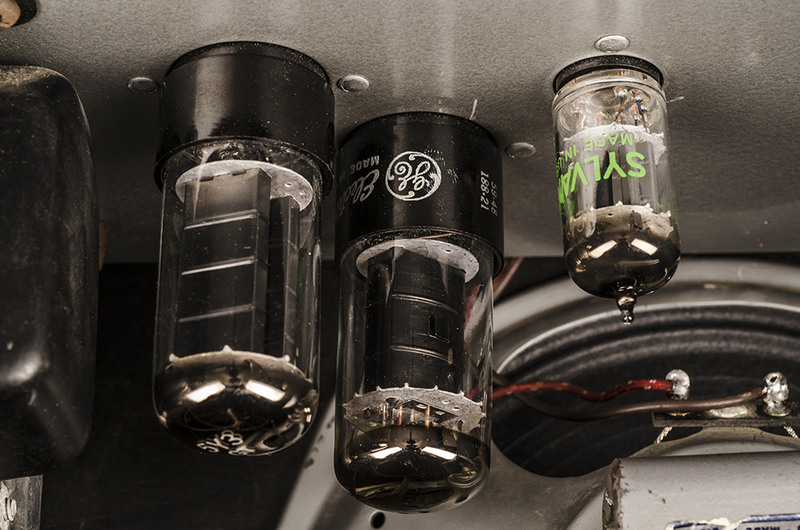 The tubes consist of a single 6V6, a 12AX7, and a 5Y3 rectifier. 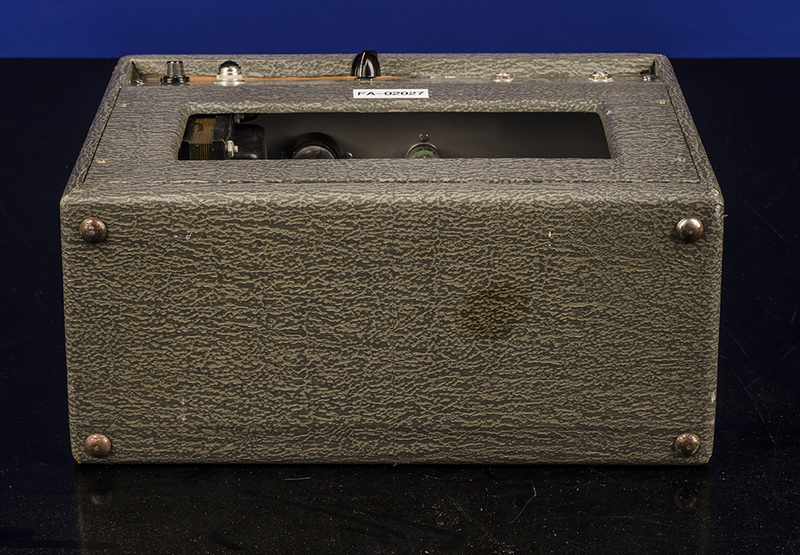 The five digit serial number T9080 is stamped in blind on the inside base of the cabinet. This Rickenbacker amp has a nice vintage fuzzy tube sound. 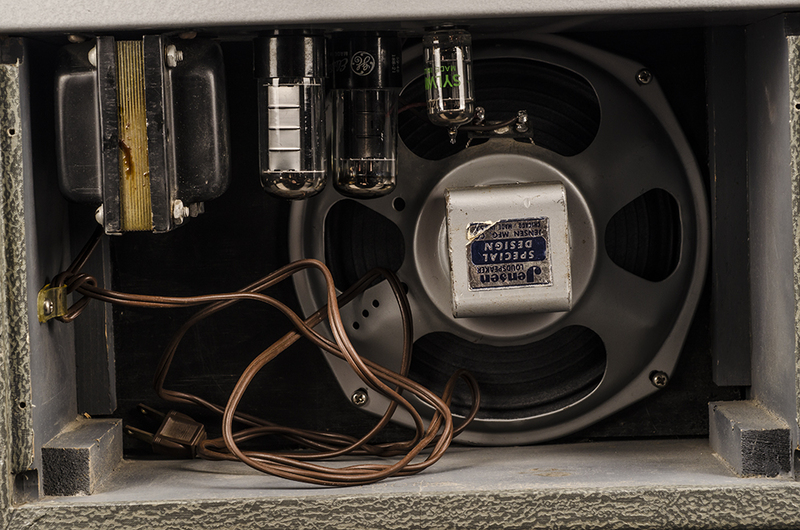 The plastic handle and silver-gray color give the amp a very 50's look. 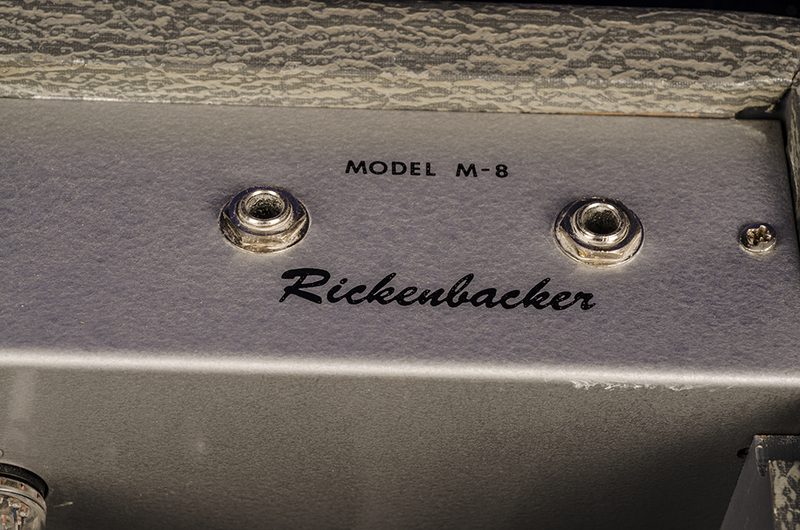 There is an old Rickenbacker sticker on the top of the cabinet by the handle. 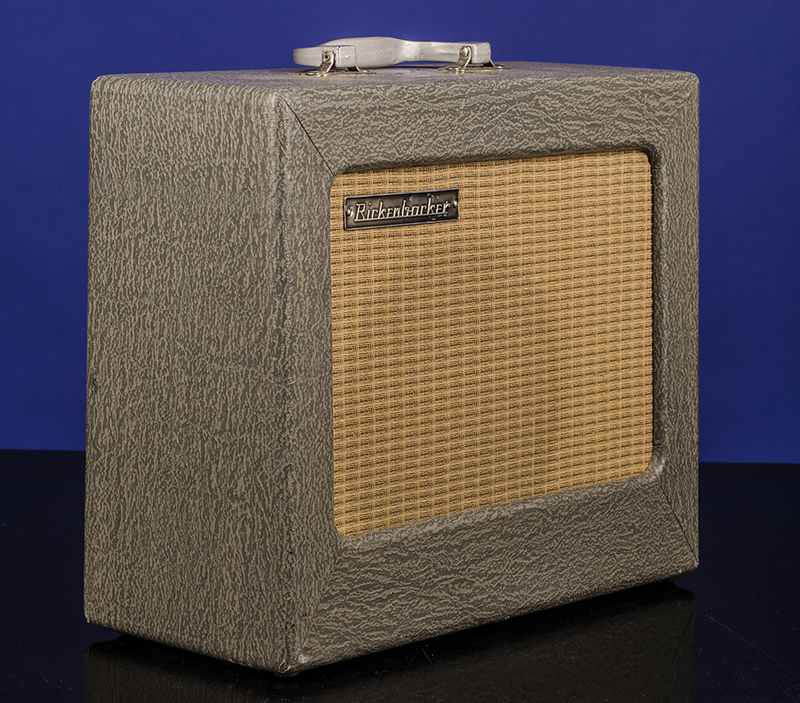 This sixty year old and now rather rare combo is in superb and exceptionally fine (9.00) condition with virtually no wear to the tolex or grill cloth. We have had the amplifier fully serviced including the expert re-cone of the speaker. Rickenbacker's version of the the Fender Champ Combo. Run it at low volume for great sounding cleans. Crank this little amp for warm overdrive that just can't be found from anything but a small combo amp. Perfect in the studio or at home! 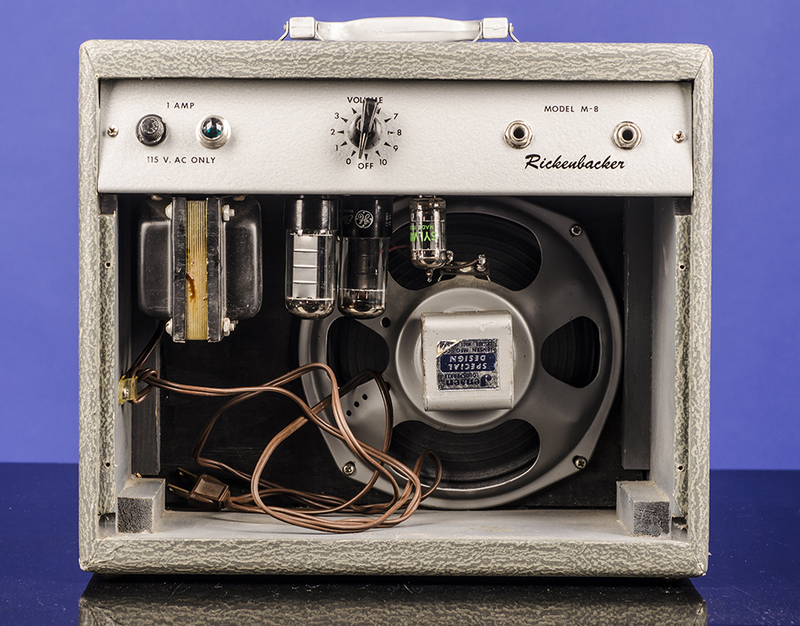 "There are only a handful of tube amplifiers that Rickenbacker is known for building. Some of the early ones were produced in the 1950's. The Richenbacher (note spelling) M-8 is one of the first specimens. 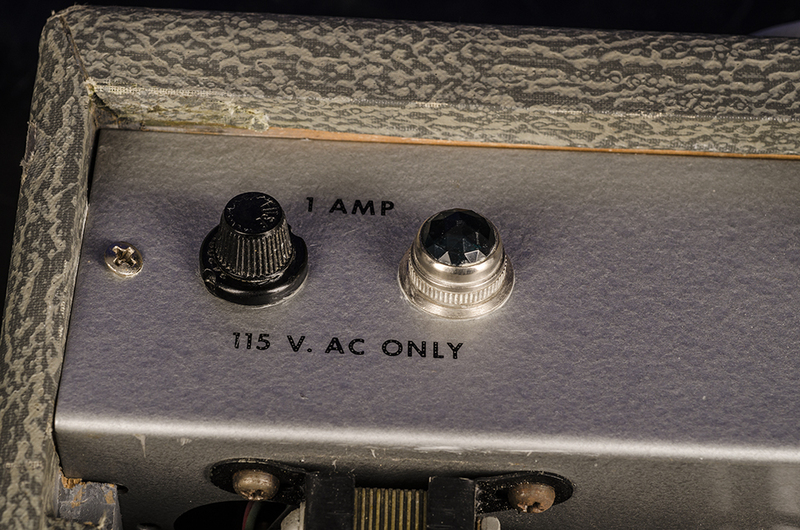 This amp was released before they had everything say Rickenbacker. 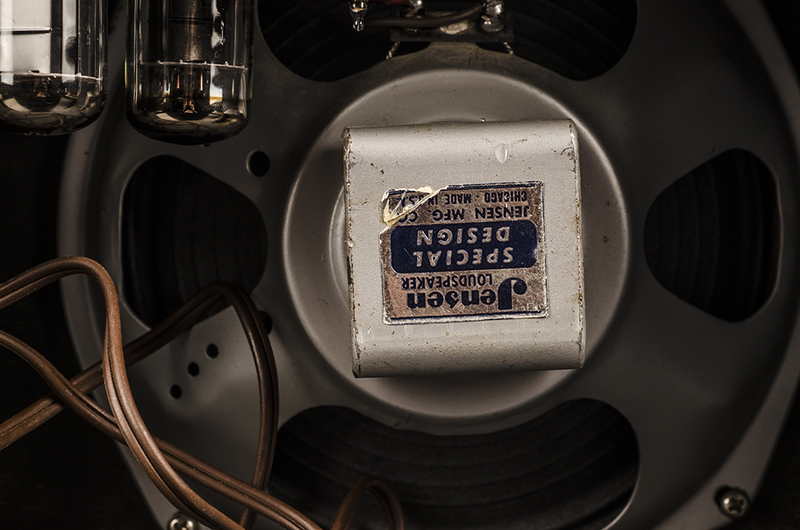 There were also other tube amps made over the years, but little is known about them. The Rickenbacker web siite provides a schematic of the tube amplifiers, that may help in identification." (Fjestad. Blue Book of Guitar Amplifiers 1st Edition, 2002, p. 245). The current (2017) Vintage Guitar Price Guide shows the value as between $400 and $550 - but go and find one!!!!! 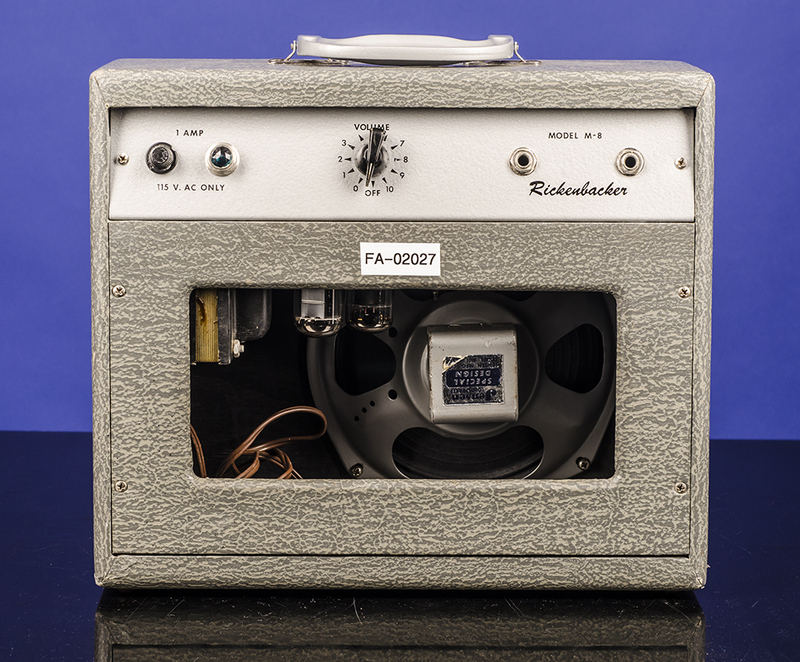 In 1953, FC Hall purchased the Rickenbacker company, and set about revamping the company’s amplifier line-up. 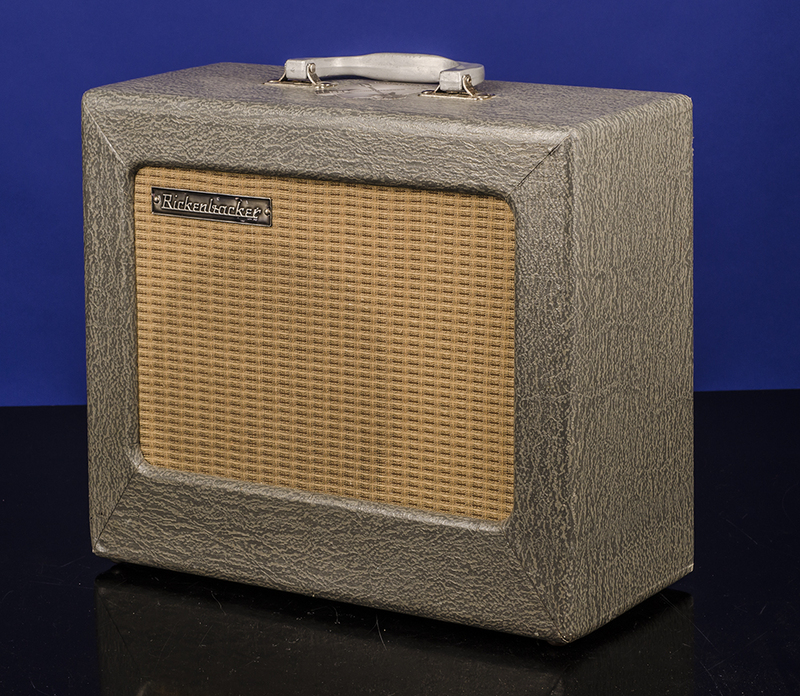 The M-8 made its debut in 1955 – albeit as an unnamed amplifier that was packaged up with a ‘Student Hawaiian Guitar Set’ and the specs changed over the years with altered badge placement, different preamp valves and various types of tolex used to cover it.